Sourcing materials is essential to ensuring a project runs smoothly and cost-effectively. Vendor qualification serves as an important step to ensuring a successful sourcing process. Each project requires a different set of standards and can determine a vendor’s ability to match your needs. For example, your thermoforming vendor will be quite different from your precision metal stamping vendor. By qualifying vendors, a company gains product and service consistency to its desired requirements. Going forward, they also have a tried-and-true choice to source materials from. Initiating and maintaining a process for vendor sourcing allows for consistency and proper analysis of vendor selection each time. First determine material specifications. Know what your goals are and be able to interpret these to the potential vendor. This will allow you to properly evaluate the validity of a sourcing partnership. Next, establish fee restrictions, as well as any service requirements. Once you evaluate risk, set up and send out questionnaires to potential vendors. Within these steps, material failure evaluation is crucial. Understanding the risk associated with a vendor and their supplied materials helps prevent catastrophic failures in manufacturing. Beyond the general and informative questions, include questions that are specific to the type of vendor you are looking for. A customized questionnaire will help to ask questions specific to the manufacturing process that could impact your project’s timeline. While it’s great to get specific with your questions, avoid invasive questions. Asking about a manufacturer’s backend finances may deter the vendor from completing the qualification questionnaire. Treat the questionnaire as an introduction to what vendors can expect from working with your sourcing company. If you have a set process and questionnaire in place, it only makes sense to have a set evaluation process, as well. Recording capabilities, certifications, quality assurance, equipment, referrals and more lets you put the data side-by-side. Each candidate will have to stack up to your standards at the very least, with one prevailing above the rest as the vendor for your project. As metal stamping experts, our staff at American Industrial Company created a helpful guide for choosing a metal stamper. 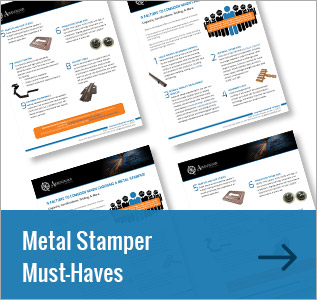 Access our Metal Stamper Must-Haves Guide for useful information on sourcing companies and vendor selection. For more on selecting the right vendor, especially for metal stamping, get in touch with our team today.